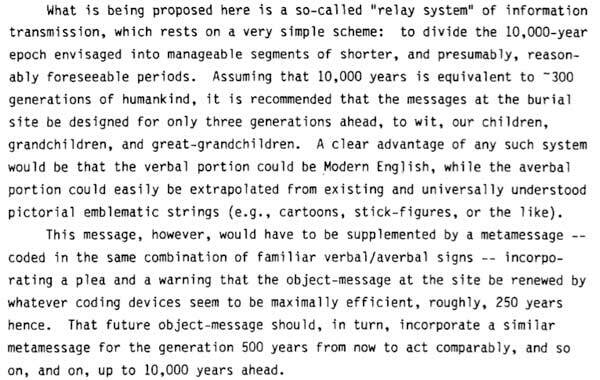 Excerpt from Sebeok’s “Communication Measures to Bridge 10 Millennia” for the US Office of Nuclear Waste Management. The Long Now Foundation’s time frame of 10,000 years is often compared to the time frame for storage of nuclear waste. We have paid a good bit of attention to the various endeavors to store nuclear waste by multiple governments, have hosted representatives at our conferences, and have visited a few sites in person. In this document (effective September 1981 and published in April 1984) Sebeok discusses problems of communicating the danger of deposits of nuclear waste over 10 000 years (the danger period chosen for such waste) and proposes the establishment of a “relay-system” of communization … with built-in enforcement mechanisms” – the so called “atomic priesthood”. The report is available from United States National Technical Information Service (http://www.ntis.gov/) and may be downloaded or a hardcopy purchased here. What is most interesting to me is that the solution he comes up with is similar to the ones discussed internally at Long Now. That you must divide the 10,000 year time frame into generational chunks to make them tractable and contextual. As near as I can tell he does not note that the site may be exhumed for re-processing, which both Peter Schwartz and Stewart Brand find likely. He does also point out the utility of error correction codes in the ‘story’ that is passed down to minimise the re-telling distortion entropy. This idea reminds me of one Danny Hillis proposed in which one would actually not mark the site, but mark many other sites with clues, that once put together, would be a sort of test to be sure you understood the dangers — before revealing the location.